Westside Economic Alliance forum focuses on construction workforce; schools say they are working on more alternatives to college offering prospects of higher pay. Oregon's expanding economy is entering its 10th year, but a panel warns that its continued progress will be slowed by a lack of skilled workers. 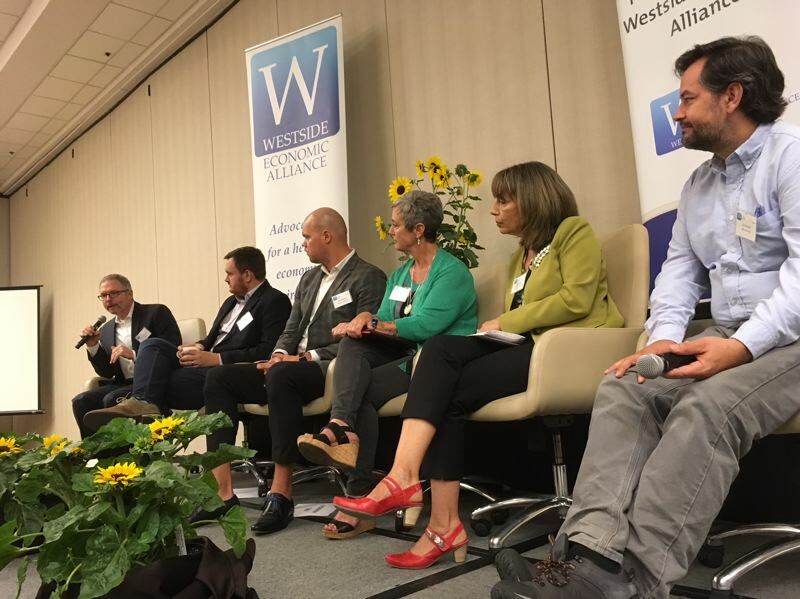 Panel members from construction, labor unions and education spoke Thursday (June 28) at a forum sponsored by the Westside Economic Alliance in Tigard. The nation is now in its second longest economic expansion since the end of World War II — surpassed only by the decade between 1991 and 2001 — but Oregon is affected by the high cost of housing and a lack of office and warehouse space. "Some of them are potential self-inflicted wounds when it comes to trade skirmishes and wars," said Josh Lehner, an economist with the Oregon Office of Economic Analysis. He referred to Oregon's dependence on international trade — and President Donald Trump's moves or threats of U.S. tariffs against China, Canada, South Korea and Japan, three of Oregon's five largest export markets. "But the biggest supply constraint we are running into is labor. It's harder to find workers because everybody has a job again." Lehner said Oregon has regained the number of jobs lost during the 2007-09 downturn — although still short of 1990s employment levels — but a wave of retirements among the post-World War II generation known as baby boomers will continue through the next decade. On the plus side, he said, annual wage growth in Oregon is outpacing the national average of 2.5 to 3 percent. "We also are a magnet state," Lehner said. "We continue to outperform other states in bringing in young, skilled households. That is a dynamic much of the country does not have." Despite a low statewide unemployment rate of 4.1 percent in May, Andrew McGough, executive director of Worksystems Inc., said there is more to be done to boost the prospects of Oregonians with low-paying jobs. "Yes, everybody is working, but not everybody who is working is earning enough to support themselves and their families," said McGough, whose agency covers Multnomah and Washington counties. Of 20 percent of Oregon's workforce, he added, "that's a market where we need to figure out how to move people up." The president of a construction company and a representative of the electricians' union warned of a growing shortage of skilled workers — and public attitudes toward trades are a factor. "We have a fundamental issue as a nation and region where people do not believe that success is swinging a hammer or torqueing a wrench. If that doesn't change, the problem becomes extreme," said Joel Andersen, president of his family's construction company based in Portland, now in its third generation. "Everyone has to believe that a career in trades is just as successful as being a dentist, an accountant, a real estate broker or anything else." 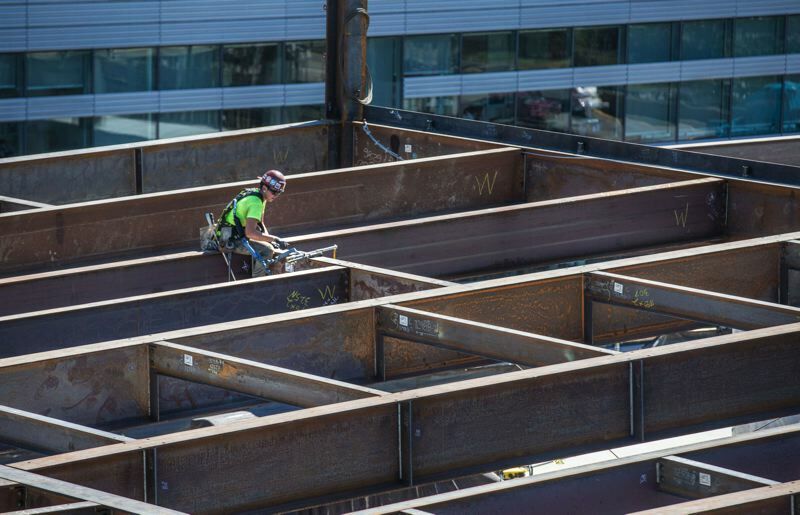 According to Oregon Employment Department figures, construction accounted for 106,600 jobs in May, about 5.6 percent of the total nonfarm workforce of 1.9 million. Its recent low point was 62,100 in January 2011, down from a previous high of 109,432 in August 2007. Jon Jensen is a journeyman wireman electrician and graduate of a joint apprenticeship program of the National Electrical Contractors of America and the International Brotherhood of Electrical Workers. He now works in political outreach for IBEW Local 48. In a 2017 survey, he said, only 3 percent of high school graduates said they considered a career in construction trades. Like many others, Jensen said, "I went (to college) because that was the only option I was presented," but he dropped out "because it was not for me." "There is still an outsized emphasis on that as the only career path for kids," he said. "Unfortunately, there is no instant fix. This labor shortage is not unique to construction." Two local education officials say they are working to offer students more alternatives to college. Janine Weir, now the coordinator of the High School Success Program for the Beaverton School District, has worked in occupations as different as law enforcement and welding. "We know that ninth graders who are off-track in key areas … don't generally graduate at the four-year mark," said Weir, who started with the district in 2001 with a program for at-risk students at Merlo Station High School. The district offers 34 career and technical education programs, and Weir said among the most successful are health care and automotive technology. Her latest project at Westview High School is a program offering experiences in construction, electrical work and plumbing. "Rather than have a student pipeline into one particular career, it is to give them a wide variety of choices in experiencing multiple careers," she said. Sylvia Kelley is executive vice president of Portland Community College, where many of its 75,000 students seek to improve their skills at multiple campuses and centers. "High schools and community colleges have some image issues and marketing challenges," she said. "If we work together (with business and labor) I think it would have a strong effect on our community." One goal of new PCC President Mark Mitsui, she said, is to triple the number of available apprenticeship programs. Oregon's booming economy has downsides for PCC, Kelley said, and not just because enrollments tend to shrink. "What's happening to us right now is that because of the increased cost of housing, students who have been the core of our community are being pushed outside our service area," said Kelley, who lives in Beaverton. "The people who need education and training the most are being pushed into other areas where they do not have access to them." McGough, the panel's moderator, has a son who now is a junior in high school. Based on his conversation with a vice principal in Portland Public Schools, where students can first take elective courses in seventh grade, "Worksystems would be more than happy to help support development of a common curriculum to expose young people to high-demand, high-growth careers in our region."